Temple of the Emerald Buddha inside the walls of the Grand Palace. 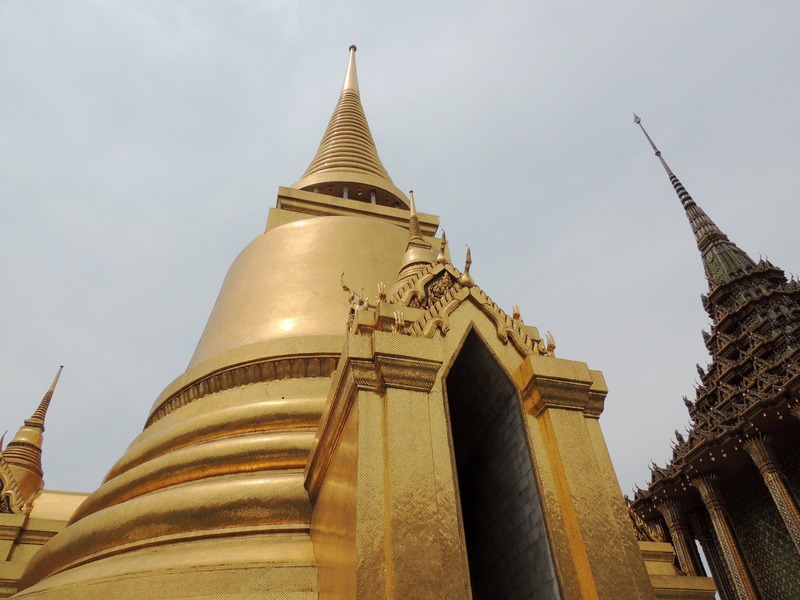 If you’re in Bangkok, you’ll want to take a day to see the temples and the sights of the old city. Start at 7 a.m. Grab some cheap breakfast from a street vendor for between ฿30 to ฿40 ($.97 to $1.29) and make your way to the Sky Train. If you haven’t done so, purchase a Rabbit Card. You can get 15 rides for ฿125 ($4.03). Hopefully, you can find a seat. Get to the Silom line and head to Saphan Taksin. This is where you’re going to take a ride on the tourist ferry for ฿40 ($1.29) one-way. If you want, you could ride the ferry all the way to the last stop. In fact, I recommend this over buying a tour ticket for ฿125 ($4.03). You can listen to the information if you take a seat at the front of the boat, but you’ll miss the beauty of the Chao Phraya. Instead, it’s better to go up front and snap pictures of the smaller boats cruising the river, the skyscrapers on the shore and Wat Arun. Get off of the ferry at Tha Maharaj. Take a right on the main street and walk to the Grand Palace. You won’t be able to miss the crowd of tourists heading that way. Keep in mind that you can’t visit the temples in shorts, tank tops and mini-skirts. If you forget, you can rent robes to cover up at the front. Walk on the main path to the ticket booth. For ฿500 ($16.13), you will purchase your ticket for the Grand Palace, Wat Phra Kaew, Wat Phra Kaew Museum, the Queen Sirikit Museum of Textiles and Dusit Palace Park (this is off the Grand Palace grounds). According to Web sites I’ve searched, the interior of the Grand Palace is open on weekdays. However, this was not the case when I went on a Monday. It could also be that it is Thai New Year (Songkram) at the time of this writing. Lawn inside Grand Palace. Behind the wall is Wat Phra Kaew. After you purchase your ticket, grab a guidebook from an employee outside the turnstiles and walk into Wat Phra Kaew. The outside of the temple is decorated with statues of demons, and there is a model of Cambodia’s Angkor Wat. However, before venturing inside the temple, head to the outer walls and see the murals depicting the Ramakian, a legend based on an Indian epic. The highlight of the trip is seeing the Emerald Buddha. You’ll need to take off your shoes before going inside the temple and photography is prohibited. Most tourists stay in the back, but you can also kneel to pay respect to the Buddha. Just remember the big rule: don’t point your feet at the Buddha (or other people for that matter). 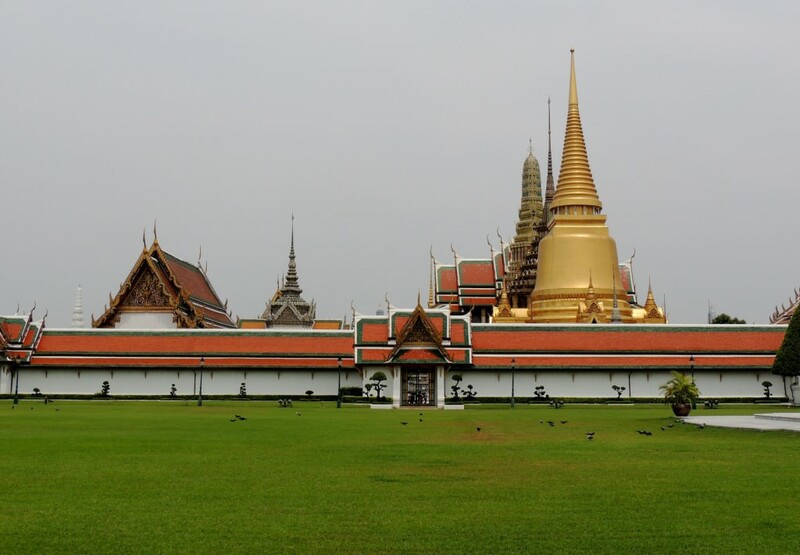 Once finished with Wat Phra Kaew, exit the temple grounds to see the Grand Palace. You’ll first see Borom Phiman Mansion. Walk to the next area, and this is where you’ll find Chakri Maha Prasat Hall. Both have ceremonial guards standing in front of the grounds that are reminiscent of England’s silent Grenadier Guards. The guards won’t move if you pose for a picture with them, but I did catch them shifting their eyes. Ceremonial guards don’t move outside Chakri Maha Prasat Hall, but you may catch them taking cursory glances at people. Once your tour of the palace grounds is finished, you’ll head inside the museum. It houses various ornaments, statues and jewelry of the Buddha and information on Thailand’s King Rama IX. The other museum on the grounds is the Museum of Textiles, which features modern Thai fashion and includes outfits worn by Queen Sirikit during her visits to Europe and the United States in 1960. By now, a few hours have passed. If you’re hungry, find a street vendor or head back toward the dock where you can buy lunch between ฿50 to ฿60 ($1.61 – $1.94). When finished, walk south along Th Maha Rat and make a left at Th Thai Wang to enter Wat Pho. Entry is ฿100 ($3.23) and includes a free bottle of water. 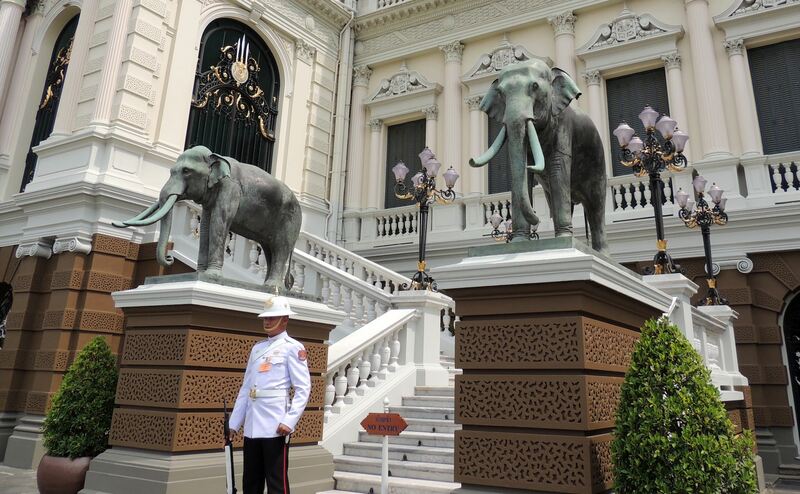 Remember the same clothing rules enforced at the Grand Palace apply here. The grounds here are a lot smaller than the Grand Palace, but Wat Pho is still huge. You’ll first start outside the Viharn of the Reclining Buddha. It’s the largest image of Buddha on the grounds showing a reclinding Buddha before ascending to Nirvana. The temple is always packed. You’ll move with a crowd and walk around the statue, but there are a few areas where you can walk out of the group and snap pictures. 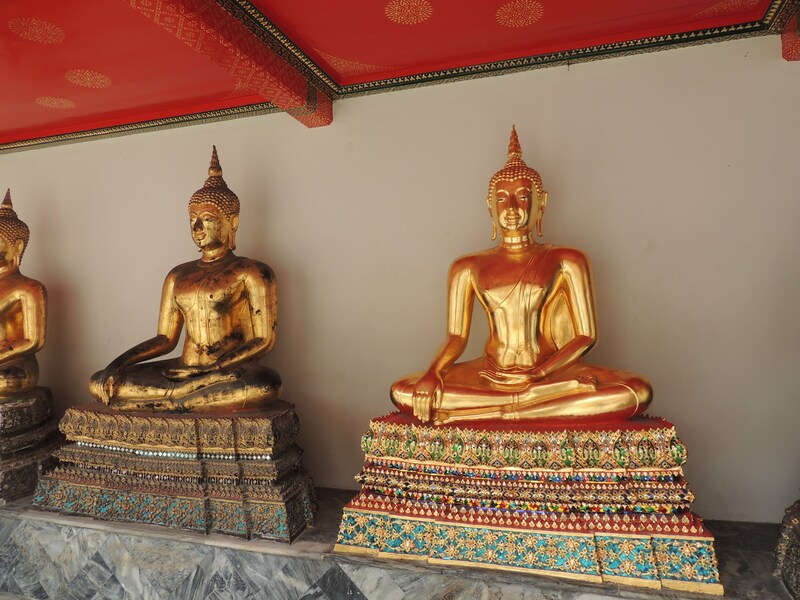 The rest of Wat Pho is home to other Buddha images and temples. It also serves as a residence for Buddhist monks and a school for teaching Thai medicine and massage. Buddha statues inside the outer courtyard of the main temple at Wat Pho. 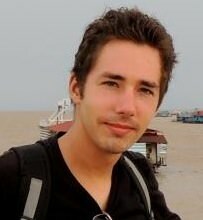 After Wat Pho, head back to Th Thai Wang and walk toward the Tha Tien dock. Grab a ferry back to Saphan Taksin. If you’re lucky, the ferry will be so crowded that you won’t have to buy a ticket. Otherwise, you need to purchase it on the boat. Now your evening is free. If you like, you could try to catch a tuk-tuk, taxi or bus to Dusit Palace Park before getting on the ferry or get ready for a wild evening on Khao San Road. Alternatively, you could head to Chinatown for the best Chinese food I’ve ever had or get your shopping fix at MBK. Whatever you decide, you won’t get bored with Bangkok.